A better way to PayLah! is here. Say hello to a fresh new look, a more intuitive experience and better compatibility with your day-to-day! Watch how easy it is to scan and PayLah! DINE Enjoy your favourite hawker foods with a quicker way to pay when you scan QR Codes displayed at selected stalls. Just spot our PayLah! payment logo and ask to pay with PayLah! QR Code for a faster and seamless checkout. SHOP Scan and Paylah! at your favourite stores with up to thousands of participating merchants. Simply look out for the PayLah! payment logo or the NETS QR Code! Click here for the full list of eligible NETS merchants. Don’t have PayLah!? Download and register today! Scan and pay with QR Code via NETS terminals or PayLah! QR Code NEW! Send / Receive Money: Send or receive funds from anyone, even non-DBS/POSB customers via mobile numbers, QR Codes and Payment Links NEW! Notify Your Friends: Receive or send WhatsApp Notifications when you send / request for funds! Click here for the PayLah! user guide. Participating merchants with NETS terminals. Click here for full list. Retail stores that display the PayLah! QR Code logo. Click here for full list. Click here for full list of Billing Organisations. Click here for full list of Charity Organisations that you can donate to. DBS PayLah! is a personal mobile wallet which allows you to perform fund transfers via a mobile number. You can also send eAng Baos, request for funds from others, request for payment links, pay your bills, donate money to charitable organisations and more! You can even pay with DBS PayLah! for your online purchases securely and swiftly at selected merchants! DBS PayLah! is free of charge to use and is available to non-DBS/POSB customers and existing DBS/POSB customers. So everyone can PayLah! You have to be at least 16 years of age and have a smartphone with a Singapore registered 8-digit mobile number. Is DBS PayLah! safe to use? For logins, you have to enter an alphanumeric DBS PayLah! personal password. We recommend that you change your password regularly by tapping on Settings > Reset PayLah! Password. If you are using an Apple iPhone 5S (or newer) mobile device operating on iOS Version 8.0 (or newer), you may also use the fingerprint stored on your mobile device (the Touch ID function) as an alternative to your personal Password to access and use the DBS PayLah! app. Note: Touch ID function on your Apple iPhone mobile device allows you to store someone else’s fingerprint to access and use the functions of your mobile device. Thus if you choose to enable the Touch ID function for access to DBS PayLah! app, we recommend that you should only store your own fingerprint on your mobile device to prevent others from accessing and using your DBS PayLah! app. Your DBS PayLah! wallet limit and daily transfer limit are each capped at S$999 by default. For DBS/POSB iBanking users, you can adjust both limits to levels that you are comfortable with. Adjustment of limits is not available to non-DBS/POSB iBanking users. For enhanced security, we recommend that you lock your smartphone with a password. Can I have more than 1 DBS PayLah! wallet? Yes. Each customer can have more than one DBS PayLah! wallet. Two additional unique DBS PayLah! wallets registered under a non-iBanking User Profile and with two separate mobile numbers. Up to a maximum of three DBS PayLah! wallets registered under a non-iBanking User Profile with three separate mobile numbers. I forgot my DBS PayLah! password, what do I do? You may click on the "?" icon on the login page. If you are a DBS/POSB iBanking user: You will be prompted to re-activate DBS PayLah! as listed in step 1 of question 4 above before entering a new personal password to be changed. You will be prompted to enter your Recovery Email Address before entering a new personal password to be changed. A Confirmation PIN will be sent to your recovery email address before your password change is confirmed. I have changed my mobile number/smart phone, what do I do? Simply download and install the DBS PayLah! app from Google Play Store or iTunes App Store on your smartphone. Step 3 Key in your existing DBS PayLah! personal password. Your latest balance and past transaction records will automatically be available on your new smartphone. You can update the mobile number linked to your DBS PayLah! wallet by tapping on Settings > Change Mobile Number. After updating, a 6-digit SMS Secure PIN will be sent to your new mobile number for authentication. Changing the mobile number linked to your DBS PayLah! wallet will not automatically update the mobile number registered in your personal records with the Bank. How do I enable touch ID for DBS PayLah! login? This is only available for Apple iPhone 5S (or newer) mobile device operating on iOS Version 8.0 (or newer). If you are registering for DBS PayLah! for the first time, you will be prompted to activate Touch ID during the registration process. For existing DBS PayLah! users, you can activate or deactivate your Touch ID function at any time by tapping on Settings > Touch ID login. I have lost my smartphone, what should I do? Simply call 1800-111-1111 (or +65 6327 2265 from overseas) or visit any of our branches. As far as possible, we will strive to help to block your DBS PayLah! wallet to prevent it from being compromised. At any time, you may also request to close your wallet and have the wallet balance credited back to your linked DBS/POSB savings/current account. Please note that DBS is not liable for any loss suffered by you arising from the loss of your smartphone. What is my maximum DBS PayLah! wallet limit? For DBS PayLah! wallets registered under iBanking User Profiles, you can set a daily transfer limit of S$100, S$200, S$500 or S$999 for your DBS PayLah! wallet. Tap on Settings > Daily Transfer Limit to do so. For DBS PayLah! wallets registered under a non-iBanking User Profile, the daily transfer limit is defaulted to S$999 and cannot be changed. E.g. If you have set your daily transfer limit as S$999 but would like to send S$800 each to two different friends, you will only be able to pay one friend in full as the total amount of S$1,600 is higher than your daily transfer limit. What is my daily transfer limit? For DBS PayLah! wallets registered under iBanking User Profiles, you can set and adjust the wallet limit (maximum limit of S$999) by tapping on Settings > Change max PayLah! Wallet Limit. For DBS PayLah! wallets registered under a non-iBanking User Profile, the wallet limit is defaulted to S$999 and cannot be changed. If you set your wallet limit to $0, all incoming funds will be automatically sent to your linked DBS/POSB bank account. You will also not be able to send money to others. If someone sends you an amount which exceeds your wallet limit, the excess amount will be automatically sent to your linked DBS/POSB bank account. You will see this automatic transfer of the excess amount as a Maxed-Out transaction in your Transaction History. E.g. You have set your wallet limit as S$200. You transferred S$40 to your friend for a meal. The remaining wallet balance is now S$160. Your friend transfers S$100 to you for a gadget you helped him to buy. However, as the wallet limit is capped at S$200, the excess S$60 will be credited to your DBS/POSB savings/current account directly and the DBS PayLah! wallet will show a balance of S$200. How do I top up my DBS PayLah! wallet with a non-DBS/POSB account? Non-DBS customers or DBS customers without iBanking can top up your PayLah! wallet via online FAST transfers from other bank accounts. Note: Please ensure your top-up amount does not cause your PayLah! balance to exceed the wallet limit of S$999.00. How if the person receiving my money does not have a DBS PayLah! wallet? The recipient will receive an SMS alert to download the DBS PayLah! app within 14 calendar days. The funds will be automatically credited into his/her DBS PayLah! wallet once he/she successfully registers. How do I receive money from friends? For existing DBS PayLah! users, the money from senders will be credited instantly into your wallet. For non-existing DBS PayLah! users, the money will not be credited into your wallet until you register for DBS PayLah! How do I send reminder(s) to my friends to respond to my money transfer request? You can send reminder(s) to your friend (in a Single Request) or friends (in a Group Request) who have yet to respond by tapping on Remind under the transaction details page. How do I cancel a money transfer request after it has been sent? You can cancel a money transfer request under the transaction details page within 14 calendar days. You can still view the cancelled transaction which will be listed in grey under the Pending tab in your Transaction History. How do I top up my Mobile Prepaid SIM Card? You can top up your M1 or Starhub Mobile Prepaid SIM Card by tapping on Send (on the Homepage) > Mobile Prepaid Top Up, followed by selecting the Telco. Proceed to enter a mobile number and select the amount that you wish to top up, before you submit. What is a Consumer Reference Number? Your Consumer Reference Number is a reference number given by the Billing Organisation and it is usually stated on your bill. It is your responsibility to enter the correct Consumer Reference Number or your Bill Payment transaction might not be successful. You can make a Donation by tapping on Send (on the Homepage) > Donation, followed by entering or selecting the Charity and the amount that you wish to donate. You will be required to provide your Full Name and NRIC or FIN number which will be sent to the Charitable Organisation should the donation be tax deductible. Please note that not all donations are tax deductible, therefore it is your responsibility to check with the Charitable Organisation to determine whether the Charitable Organisation qualifies for tax deductions before making the donation. How do I pay for my online purchases? Select the option to pay with DBS PayLah! on the merchant's checkout page and then enter your DBS PayLah! mobile number to continue. Your online merchant will initiate a request for payment to your DBS PayLah! wallet and you will be notified via a push notification to log in to your app. Upon log in, simply verify the payment details of your online purchase and tap on Pay Now to confirm. Once successful, you will receive a confirmation SMS for your records and you may return to your merchant's website to view the completed purchase. Select the option to pay with DBS PayLah! on the merchant's checkout page. Your DBS PayLah! app will be launched automatically and proceed to log in. Once successful, you will receive a confirmation SMS for your records and you will be redirected back to your merchant's app to view the completed purchase. How do I use DBS PayLah! on Apple Watch? DBS PayLah! for Apple Watch complements your mobile wallet experience on the Apple iPhone. You can now Send Money (to a single recipient) as well as Accept Requests for Funds from another user. You can receive notifications and view your wallet balance directly on your wrist. For DBS PayLah! to function on your Apple Watch, you must have logged in at least once to PayLah! app on your iPhone (for new users). You will also need to connect your iPhone to your Apple Watch via Bluetooth and you must be in connection range for both devices. How do I enable DBS PayLah! for Apple Watch? To enable DBS PayLah! for Apple Watch, simply connect your watch with your iPhone via Bluetooth. Tap on My Watch on Apple Watch followed by DBS PayLah!. Then tap on either Show App on Apple Watch or Show in Glances to complete the synchronisation. Note: Your iPhone must be operating on iOS 8.2 or newer. Do I need to log in to DBS PayLah! on the Apple Watch? You do not need to log in to DBS PayLah! app on the Apple Watch separately. Simply enable DBS PayLah! on your Apple Watch as per above steps and you will be able to view your balances and receive notifications as long as you are connected with your iPhone via Bluetooth and you are within range. Why can't I view PayLah! balances or receive notifications on my Apple Watch? You have logged in at least once to DBS PayLah! app on your iPhone (for users who have recently installed DBS PayLah! on your device). Your iPhone is connected to your Apple Watch by Bluetooth and that you are within range of your iPhone. You have enabled DBS PayLah! on your Apple Watch. You have enabled Push Notifications for DBS PayLah! on your iPhone settings. Your iPhone is not in the unlocked status, in which case, your notifications will be received on your iPhone. 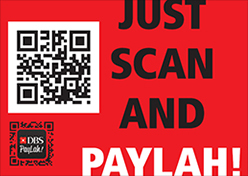 How to Scan & Pay with DBS PayLah! on a NETS Terminal? Log in to his/her PayLah! app and click the QR Code icon at the top right hand corner of the Home Screen to activate the QR Code Scanner. Verify the payment details reflected on the NETS terminal or the receipt. Scan the QR Code on the NETS terminal or the receipt. Once successful, a confirmation screen will appear on your PayLah! app and you will receive a confirmation SMS. How secure is a NETS QR transactions? A NETS QR transaction is as secure as a NETS EFTPOS card & PIN transaction. The payment is processed via the scanning of a unique QR Code, on the PayLah! app, which is dynamically generated for every new transaction. Additionally, users have to log in to PayLah! app via fingerprint or password login each time to effect a QR Code payment. 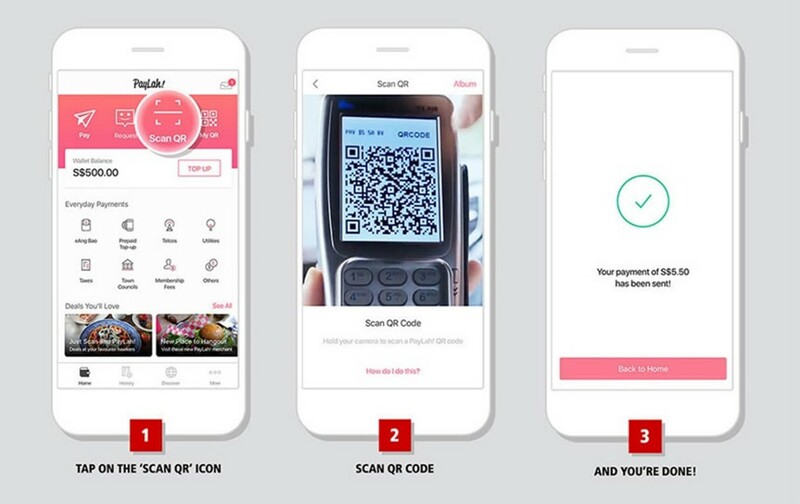 Where can users Scan & Pay with DBS PayLah! on a NETS Terminal? NETS QR Code transactions are available at selected NETS merchants accepting QR Code payments. PayLah! users can look out for the PayLah! Scan & Pay logo at these accepted merchants. Do the credit balances in my DBS PayLah! wallet earn any interest? No, the available credit balances in your DBS PayLah! wallet do not earn any interest. How do I delete my DBS PayLah! account? We are sorry you have to close your DBS PayLah! account. You can delete your account by calling our DBS contact center at 1800-111-1111. What if I want to close my DBS/POSB savings/current account(s)? Please inform the branch staff that you have a DBS PayLah! wallet when closing your DBS/POSB savings/current account(s). When you close your linked DBS/POSB savings/current account(s), the balance in the wallet will be refunded to you. Please note that DBS reserves the right to deal with the unclaimed amount if your wallet has not been used for a period of one year and if you have not given any instructions to DBS to close your wallet. What if I decide to close my iBanking account? Please inform the branch staff that you have a DBS PayLah! wallet when closing your DBS iBanking account. We will proceed to close your DBS PayLah! wallet and the remaining balance in the wallet will be refunded to the linked DBS/POSB savings/current account. Will I be required to send in additional documents if I register for a DBS PayLah! wallet under a non-iBanking User Profile? Yes. For DBS PayLah! wallets registered under a non-iBanking User Profile, it is a regulatory requirement that we require users to submit a copy of their NRIC/FIN (front and back) via email to paylah@dbs.com for record purposes. While we do not require users to do so upon successful registration of the DBS PayLah! wallet, it is mandatory once users have reached a threshold of a cumulative lifetime amount of S$2,500 received from other wallets. Before the receipt and verification of the NRIC/FIN copy by DBS Bank, users might be restricted from further use of their DBS PayLah! wallet.